Over the months of shooting with my little Fuji I’ve discovered two things that can really help you get sharper pictures. While Fuji’s x-trans sensor and the excellent x-series of lenses generally produce sharp images, there are times when there are circumstances that may make for soft images, that aren’t necessarily bad technique on the part of the photographer. These tips may work for other cameras too, although the first one is specific to Fuji’s cameras. I’ve found that occasionally when I take a shot, the focus can be ever so slightly out. At first I thought that I was either doing something wrong or I was going mad. However, putting the focus point over a clearly defined area of an image and focussing, would often result in an image that was slightly soft. At first I thought that this was just the way the camera rendered, until I was looking back at some photos from my older X-Pro1 and realised that they didn’t have this softness, so I figured something was wrong. I put the camera on a tripod and focussed on an easy to define point, then switched to manual focus and zoomed in on the LCD. Sure enough, it was slightly out and could be fixed by manually tweaking the focus. There’s there’s no micro adjustments available in the camera that I’m aware of, (and also, contrast detect auto focus is generally devoid of alignment errors) I’m not talking a huge amount either, it’s only very slight, but it can result in a slightly soft image. There is a very simple solution however. All I did was shrink the focus point size and hey presto, the focus is now properly aligned. The other thing this is useful for is for shooting in low light. If you’re having trouble locking focus, increasing the sample size seems to help a great deal. I don’t know if this is just my specific camera or if this affects all models. I don’t think it’s necessarily a fault, but more of a function of the way it works. The newer Fuji’s have phase detection points on the sensor, so they may not have any similar focus alignment idiosyncrasies. Still, if you think your images are soft, you might want to try this trick. The other factor that can effect image sharpness has to do with the small size of the body, and can be a potential issue on any small camera . I noticed that in some cases, when shooting hand held, my photos would exhibit camera shake, even when my selected settings should avoid it. This was occurring even when the shutter speed was high, certainly high enough to avoid camera shake, but I was still occasionally getting slight motion blur on the images. I put this down to the fact that the body on the X-E1 is incredibly light. I find that for me it can feel unbalanced, especially with larger lenses on. To be fair, this isn’t just a fuji problem, it’s a potential issue with any mirrorless or small camera, especially the lighter ones. I think because the body is so light and the lens unbalances the camera away from a natural centre of gravity, that this causes minor vibration when the shutter fires. I could of course be completely wrong, which I’m sure people will let me know once I post this (that and how this is entirely my own fault.) Luckily the solution was really easy. I was planning on getting a third party grip or case to add weight, but I found that if I left the quick release plate from my (manfrotto) tripod on the bottom of the camera this little bit of extra weight was enough to help with the balance and stop the vibration. Now, I’m no longer getting motion blur on images taken at a reasonable shutter speed. I hope these little tips have been useful. 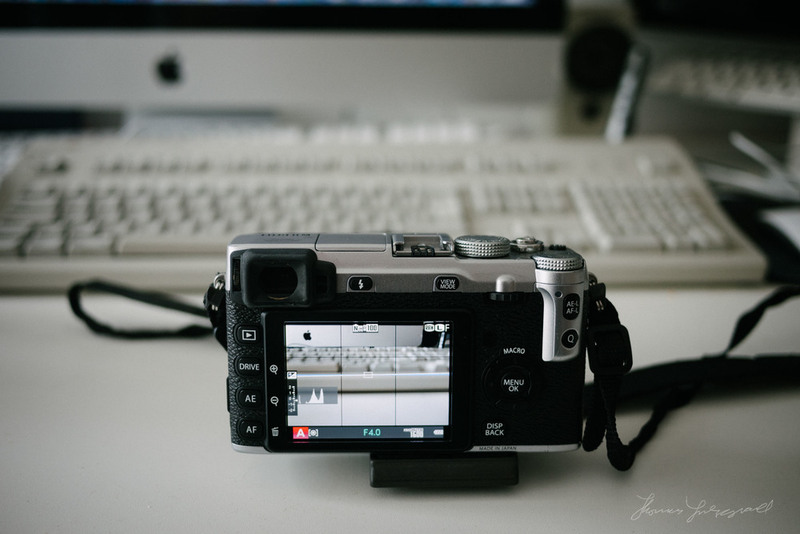 The Fuji X-E1 s a great camera, and so I hope it is understood that I’m only posting these tips to help anyone who may be having similar issues, and they’re not intended as a criticism. Incidentally, speaking of the X-E1, the camera is selling amazingly cheaply on the second hand market right now. I found one at a local camera store for €499, with the kit lens. If you’re looking for a good inexpensive way to dip your toe into Fuji’s X-System, keep an eye out for bargins.